Title says it all, the image and preview windows do not show anything other than a black screen, even the color gradient shows a black bar. No Reshade compilation indicator of any sort shows up upon loading. I have yet to set the preview executable to run as admin to try. It works perfectly fin in games though, so I am merely reporting this for development purposes. Windows 10 X64, GTX 970 latest beta drivers. Last Edit: 3 years 1 month ago by Violins77. 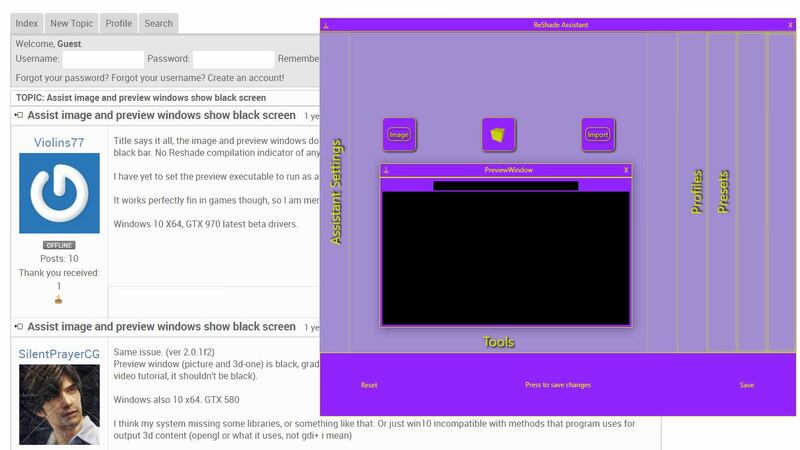 Preview window (picture and 3d-one) is black, gradient is black... Even little animated cube on 3d preview button is black (I saw video tutorial, it shouldn't be black). Моряк - с печки бряк. Things are different in compatibility mode, it loads up the image, but does not apply the effect. Reshade displays an error message "could not find profile path, reverting to default" or something similar (I'm at work now will post actual message later). It does apply the effect, but it does apply the "Default" preset to the previews. So to see changes, you need to modify that one. No, in our case it doesn't render anything, regardless of selected preset. SilentPrayerCG, set the assistant preview to Compatibility mode for Windows 8 or 7. It will display the image, but always use the default preset for some reason. Still better than nothing when waiting for a fix! I start render, but only geometry, shader didn't render correct. It black. 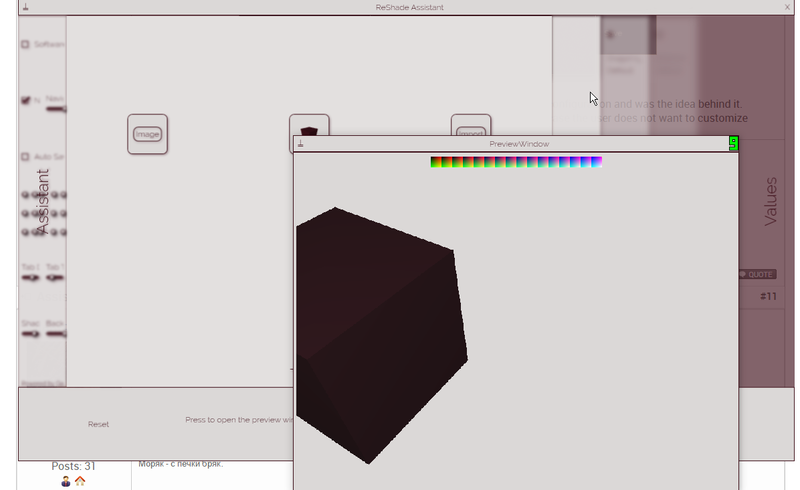 Well, the preview renders a black cube (with your current color settings), so that's kinda expected. On default settings it's pitch black, like some glitch. I think it shouldn't require some cosmetic change for proper work of some features. It's just my opinion, anyway. Not having set any tendency is good to leave and push every user to his own custom configuration and was the idea behind it. However, on the other hand it is good to have a proper example that could be used in case the user does not want to customize the Assistant (among other reasons). Can you give me your settings for the windows color scheme? I know this thread was there since more than 1 year but I am having the same issue... now. I have not changed anything, I also checked and overwrote the files with fresh from download ones, with no succcess. 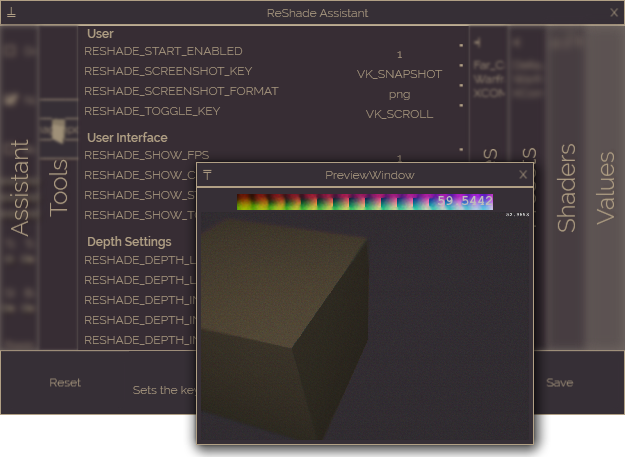 Also, I double checked both ReShade Assistant Preview.exe and ReShade Assistant.exe were as before: run as admin and W7 compatibility (I tried different combnations with compatibilities but no success). I think it might be a W10 related issue. And if I am sincere, I don't understand how the OP issue was solved. May any of you help me sort this out? Last Edit: 1 year 4 months ago by Coco-Ta.